Dr. Weeks’ Comment: Any time people are forced to take a medicine against their will, science-based information becomes a critical issue to evaluate. Washington, D.C., Feb. 2, 2015 (GLOBE NEWSWIRE) — Health officials are blaming unvaccinated children for the recent measles outbreak that started at Disneyland. However, with no blood tests proving the outbreak is from wild measles, the most likely source of the outbreak is a recently vaccinated individual, according to published science. “Numerous scientific studies indicate that children who receive a live virus vaccination can shed the disease and infect others for weeks or even months afterwards. Thus, parents who vaccinate their children can indeed put others at risk,” explains Leslie Manookian, documentary filmmaker and activist. Manookian’s award winning documentary, The Greater Good, aims to open a dialog about vaccine safety. AND Governor Christie votes for choice! Updated, 10:27 a.m. | CAMBRIDGE, England ”” Amid an outbreak of measles that has spread across 14 states, Gov. Chris Christie of New Jersey on Monday said that parents “need to have some measure of choice” about vaccinating their children against the virus, breaking with President Obama and much of the medical profession. Mr. Christie did not offer any such urgency or firmness in his original remarks. That prompted a scolding response from the White House. Mr. Obama’s senior adviser, Dan Pfeiffer, took to Twitter to request that Mr. Christie “clarify” his statement. “It’s important that responsible leaders speak with one voice,” Mr. Pfeiffer wrote. Doctors warn that up to 1,000 people may have been exposed to measles in recent weeks, a risk linked to parents who, against the advice of the medical profession, refuse to vaccinate their children for a variety of reasons. Mr. Christie spoke during an impromptu news conference in front of a facility for MedImmune, an American company that makes a nasal flu vaccine, called FluMist. 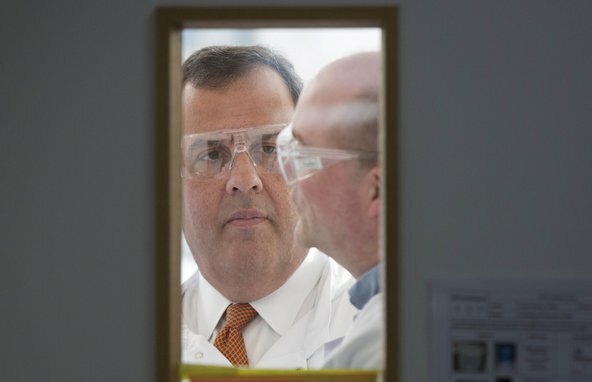 Inside, Mr. Christie donned a lab coat and protective plastic goggles. He is traveling in the London area on a three-day trade mission. 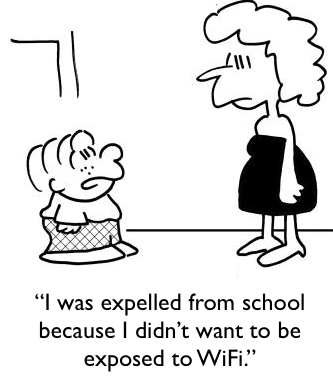 WIFI’d or FINED and Expelled – O Canada!